Last night was the Harvest Moon. The Harvest Moon is the full moon closest to the autumn equinox and it is said that this full moon is named “harvest moon” because it adds just a bit more extra light when crops need it most before harvest. My own harvest moon was not particularly photogenic by the time I got to grab my camera for a shot. 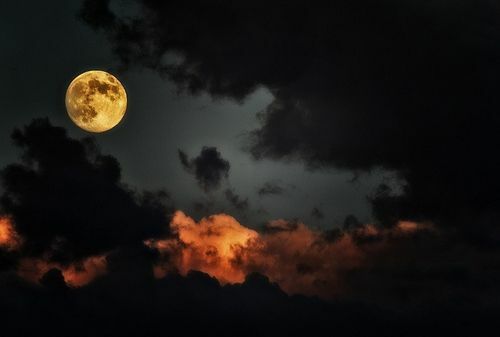 So I found this lovely, golden, harvesty, autumnal moon photograph on Pinterest. This sets the mood for our dish. Are you feeling a slight chill in the air in your neck of the woods? We aren’t quite that far along here in central New Mexico, but we did have a gorgeous September day with bright, hot sun shining down through slightly cooler-than-summertime air. That’s how it is most of the fall for us, the sun remains quite warm in this high altitude but it is tempered by gradually cooling air. Finally it is not too hot to cook something! Maybe turn on the oven for a few minutes of baking. And with a beautiful harvest of late summer foods available, what comes to mind is a light stew. Nothing heavy. Not cooked for hours. But wouldn’t a little sweetness and richness be nice to welcome the Harvest Moon? I thought so. 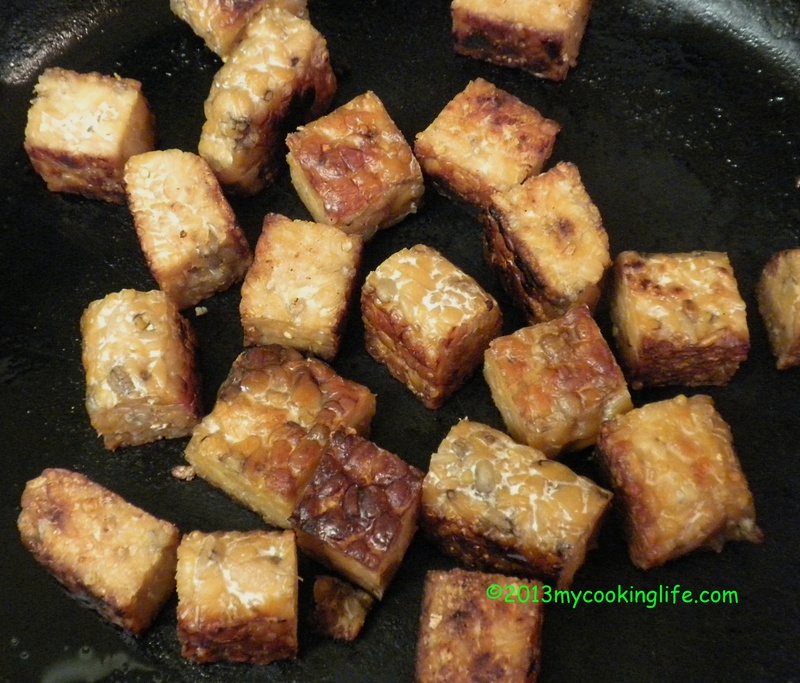 I cut up an 8-ounce package of tempeh and pan fried them in 2-3 tablespoons of avocado oil. Tempeh is a naturally fermented soybean product and this all organic one from Lightlife also contains brown rice, millet and barely. They got nice and brown and the oil gave them a richness I’ve been craving! I soaked 12 ounces of dried kombu seaweed (two pieces) and when it was softened, I cut it into one-inch squares. These went in the bottom of a roomy pot with the tempeh on top and enough water to cover the tempeh. I added soy sauce. I didn’t measure., but I can tell you that you just need enough to make a medium brown broth that definitely has the soy sauce taste but is not something that tastes really salty. When I begin cooking for fall and winter, I do use a bit more oil and salty taste than I do in spring and summer. I added a 1/2 teaspoon of turmeric. Turmeric not only creates a fabulous, warm color and wonderful flavor, but turmeric has anti-inflammatory properties that I like. 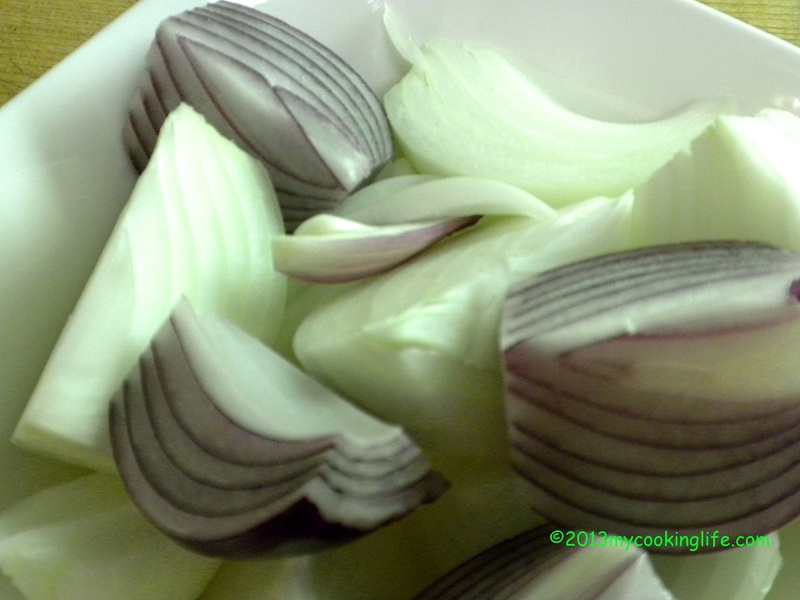 I layered in some quartered yellow and red onions. This will add a rich, sweet taste, too! I let them start to cook in the simmering tempeh and broth while I rough-cut the rest of the veggies. 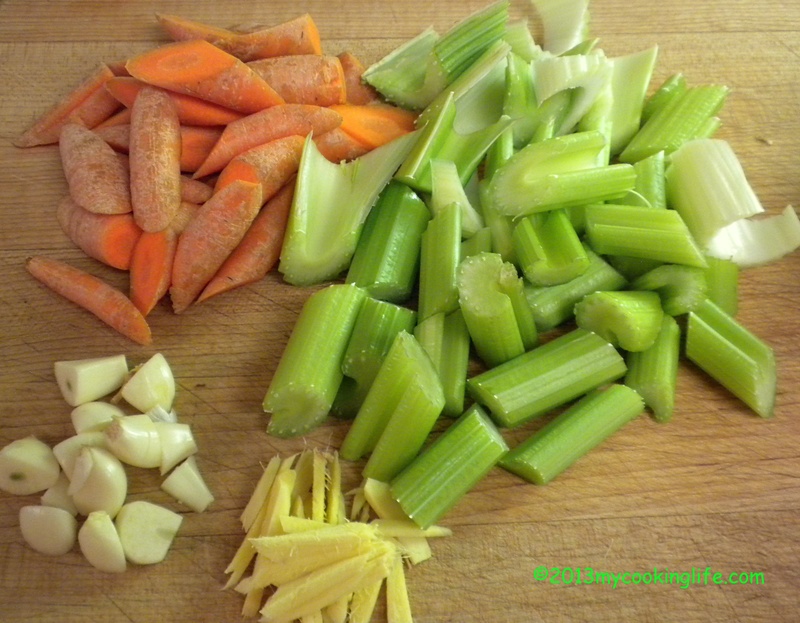 Next comes, julienned ginger, roughly cut garlic cloves, celery and carrot chunks. Into the stew they went. 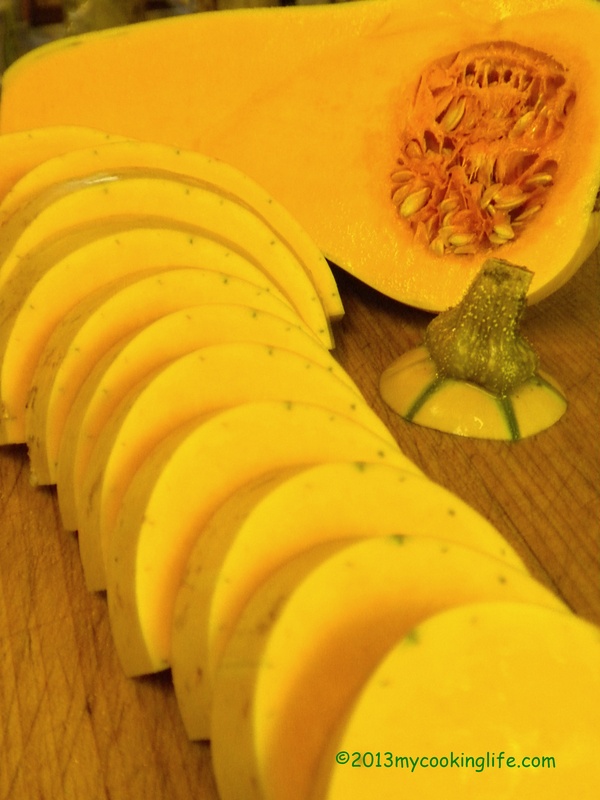 And finally, half-moon slices of butternut squash. Definitely inspired by the idea of a harvest moon! I laid these on top of the stew and put a lid on. I continued to cook the stew until the squash was tender—not a really long cooking time altogether—perhaps 30 to 40 minutes total and that is all you will need. I didn’t want my “moons” to fall apart! And so on this Harvest Moon evening, with thoughts of the coming fall season while we yet cling to the beautiful late-summer warmth, we have something sweet, rich and warm to eat that still reflects the freshness of summer’s bounty. 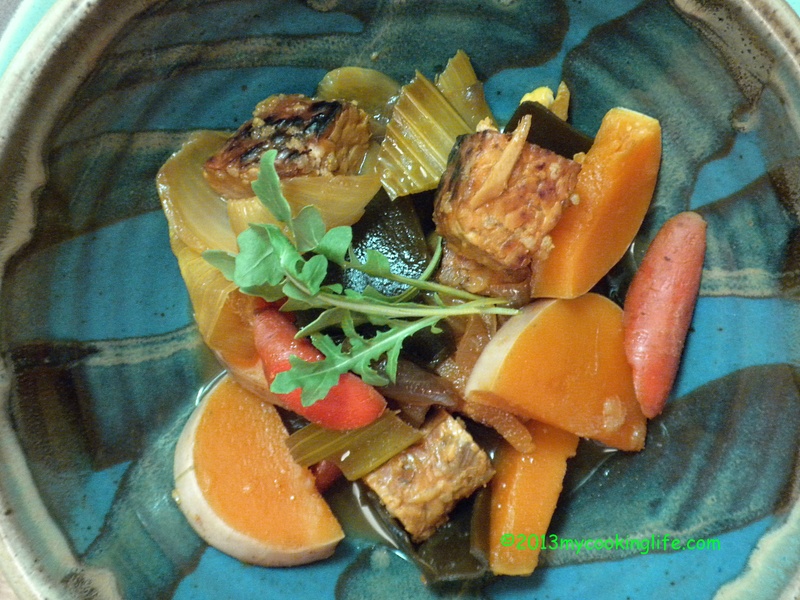 This entry was posted in Cooking, Recipes, Vegan and tagged autumn recipes, butternut squash, cooking with kombu, Equinox, Harvest Moon, sweet tasting vegetables, tempeh, turmeric, vegan stew by mycookinglifebypatty. Bookmark the permalink. Oh tempeh stew! How I would love thee. Will make thee soon, thank you Ms. Patty. You’re welcome! Having some more of it tonight along with a soup inspired by a blog I read yesterday about black bean soup. Typical of me to go a bit overboard as soon as slightly cooler weather hits! Beautiful. I’m getting recipes ready for another meatless Thanksgiving and my son loves tempeh! Oooh! Tempeh could be very nice for that! Enjoyable to read, and looks delicious! Looks delicious, and it was an enjoyable read!